MinzEye Photography for People & Pet Portraits, Wedding Photographs, and Photographic Art. Get ready for the new Experts Exchange! Need help with a technical computer problem? 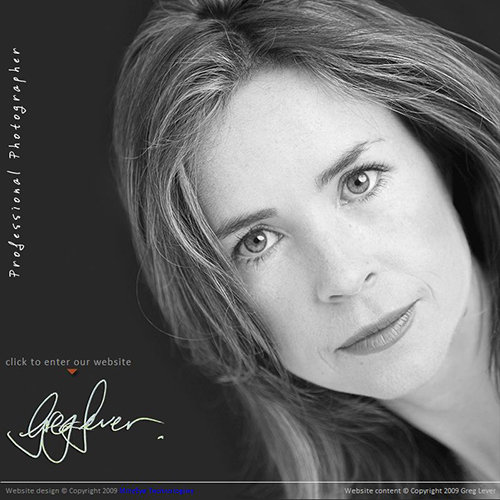 This is just a quick note to let you know that I have given my personal website (www.greglever.co.nz) a fresh look. Feel free to check it out by clicking here. Still got more photographs to load in due course, so be sure to keep checking back. Next I hope to do a “refresh” of the MinzEye Photography website and it’s content … watch this space for more. Protected: Too Close for Comfort? August 11th, 2010 Greg	Enter your password to view comments. Storm Surfers Airs on Wednesday! Okay people, this is hot of the press (so to speak) . . .
Well, I said I would have something for all the snowboarders out there, so here it is. Get out there and ride the powder guys! Being fond of the beach there have been many trips to the coastline over the years. Most times in search of waves to surf, but other times to just enjoy time there with the family, or perhaps to have some “alone time” to contemplate life. One time I was on a wharf in the Bay of Islands and I remember looking down into the water watching some small fish swimming around the wharf piles. Often water looks spectacular with the sun hitting it, but even here in the shade beneath the wharf it had a stunning turquoise colour. Then I noticed something that up until then had been very nicely camouflaged. 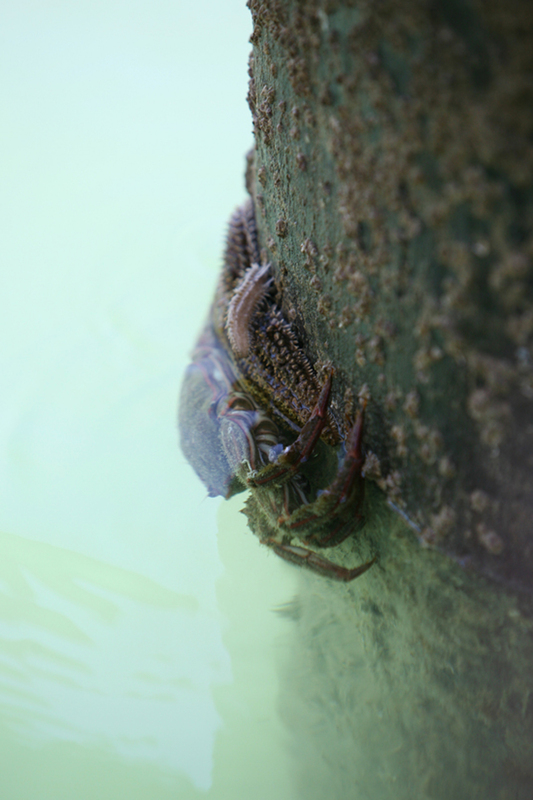 There was a starfish and a crab sharing the waterline of one of the wharf piles. I thought to myself . . .
‘Why were they just below the waterline? Okay, so you might be thinking “Who cares!” But, for me, while I was thinking about these things, I wasn’t worrying about the stresses of life. Often we forget that our minds need this “time out” so that we are better able to cope with life. When my kids are with me I’m less philosophical, and more the explorer. 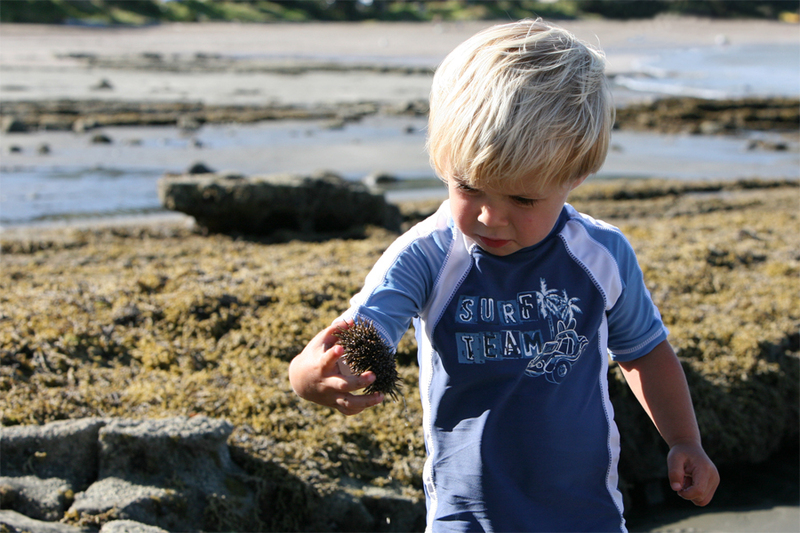 In particular with my little boy, who is always fascinated by all the different things you can find at the beach. 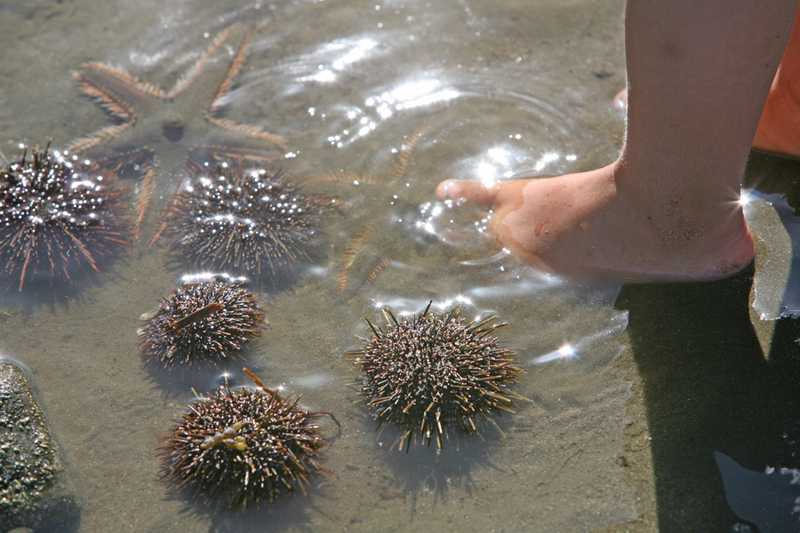 One time we came across some Kina (sea urchin) and starfish sharing some water together and he seemed mesmerized by them. Of course I had seen quite a few Kina on my many beach trips, and in fact have even stood on a few of them when surfing a local surf spot that breaks over a shallow reef where they live. But when I saw my boy’s face I realized that this was his first experience with them. And just like me, he had a few questions to ask. “What are they Dad?” “Why has it got prickles?” I love his curious nature. The way he approached them cautiously and the excitement on his face – it was really cool. But when I told him that people actually eat them, the look on his face was priceless! There are always things in nature that surprise us, things that we have never seen before. In fact, I came across something you might find interesting. Officials at the Enoshima Aquarium in Fujisawa, Japan shot an incredible time-lapse video of a giant spider crab molting its whole exoskeleton. Now that is a neat trick! How cool would it be to see that happening at the beach (as opposed to being in a bucket in Japan). Oh well, at least now when you see a crab shell on the beach, it doesn’t necessarily mean it got eaten! The moral of the story? It’s what’s on the inside that counts – so take the time to look! Last month I talked to you about the new Storm Surfers documentary. I said I would keep you posted on when it would be showing. Well, it will be screening on the Discovery Channel on 14 July 2010 (check your TV Guide for more information). In the meantime, I thought you might like to take a look at a selection of video clips. Enjoy . . .
Take care and I’ll see you next posting. Last week I uploaded some amazing images NASA took of the sun using their STEREO Ahead spacecraft. (See “Shooting Star” – Stereo Photography? blog posting). Those “solar storms” are incredibly powerful, and yet the distance between the earth and sun (approximately 93,000,000 miles) is just right for life on earth. In fact, the solar storms have a really cool “side affect” that is truly spectacular. Once the stream of electrons and other charged particles reach earth they interact with gases in the atmosphere to generate colorful aurora. 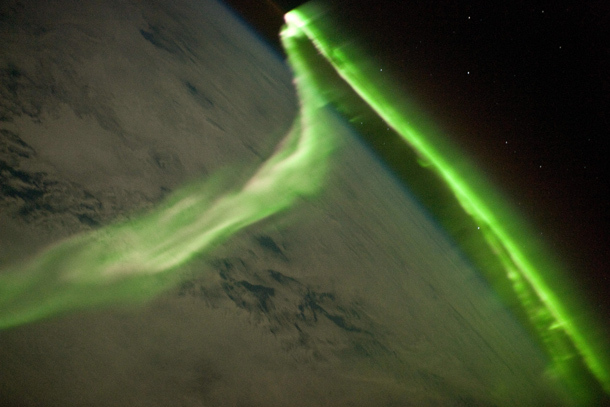 When the charged particles from May’s solar storms reached Earth, they caused no damage, but they did generate sheets of colored light dancing across polar skies. This shot was taken by astronauts onboard the International Space Station. (The photograph was taken with a Nikon D3 digital camera). It is hard to imagine the feeling of the astronauts as they watched this enormous, green ribbon shimmering below them. What a truly amazing moment to capture on camera! As you may know, these “light shows” of ever-shifting colored bands are most visible near the North (aurora borealis or northern lights) and South (aurora australis or southern lights) Poles. Apparently though, severe storms impacting the Earth’s magnetic field can shift them towards the equator. So how is the spectacular colour of an aurora produced? Auroras happen when energy charged particles streaming from the Sun interact with Earth’s magnetic field. Auroras happen when energy charged particles (ions) from the sun (known as the solar wind) collide with atoms of oxygen and nitrogen in the upper atmosphere. The atoms are excited by these collisions, and they typically emit light as they return to their original energy level. The light creates the aurora that we see. The most commonly observed color of aurora is green, caused by light emitted by excited oxygen atoms at wavelengths centered at 0.558 micrometers, or millionths of a meter. (Incidentally, visible light is reflected from healthy (green) plant leaves at approximately the same wavelength.) 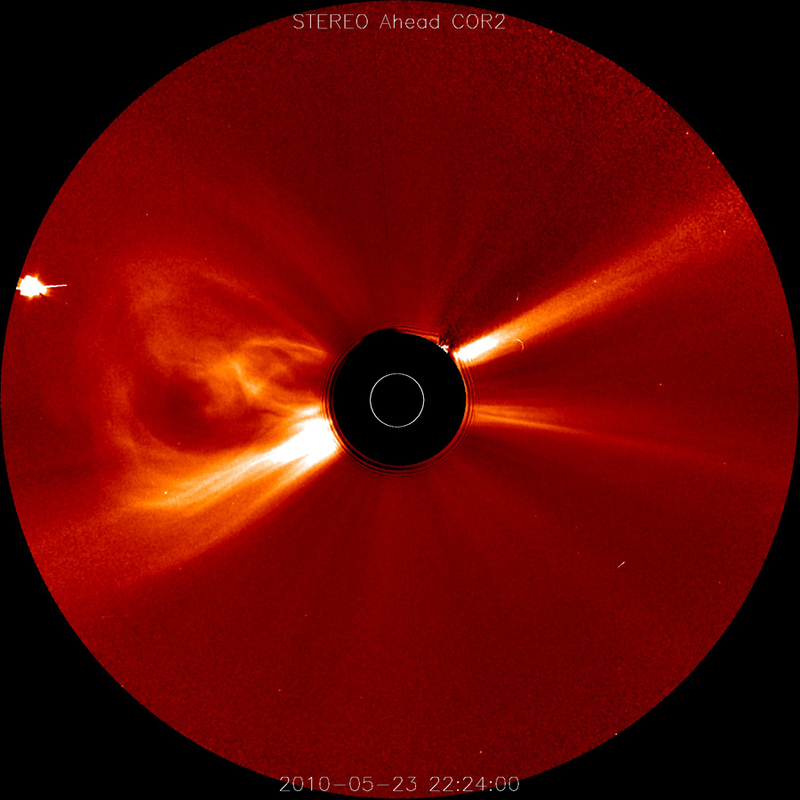 Red aurora are generated by light emitted at a longer wavelength (0.630 micrometers), and other colors such as blue and purple are also sometimes observed. Thankfully, light and how we see it will continue to stimulate our sight and the imagination. And of course, photography will continue to capture light in it’s various forms for our enjoyment. “Shooting Star” – Stereo Photography? Did you realize that the word stereo has a photographic connection? Likely when most of us hear the word we automatically think of that thing we play our music on. (Or perhaps the thing our neighbour’s play their music on late at night). Up until recently that was true of me. No, I don’t mean the noisy neighbour bit, I mean the connecting the word stereo with music. Anyhow, if you look the word stereo up in the dictionary (just click on the word if you want the easy way), you will note that it can be linked to Stereoscopy (also called stereoscopic or 3-D imaging). Which as I understand it, is any technique capable of recording three-dimensional visual information or creating the illusion of depth in an image. What I thought was kind of cool, and something else that I didn’t know until just recently, was that NASA has a spacecraft called STEREO Ahead. It’s full name, by the way, is Solar Terrestrial Relations Observations Ahead. … Hmmm … strange acronym. What do the E’s stand for I wonder? Oh wait, they are there next to the other ones .. dah … Hang on, shouldn’t it be STeReO then? Anyway, I digress. Are you still with me? … You are. Awesome! Thought for a moment you got bored and left. Glad you stayed because here comes the neat part. Check out the images that STEREO Ahead captured . . . In the top image, a bright mass of charged particles loops from the Sun’s atmosphere. (NASA calls them a “coronal mass ejection” otherwise know as a “solar storm”). Two hours later, the looped mass had expanded and was moving away from the Sun. What is that black bit in the middle of the photograph I hear you ask? Well, even with all the advances in technology, a photographer can still leave the lens cap on, can’t he? Hey, we are human you know. … Actually, I’m just kidding (you didn’t really believe me did you?). 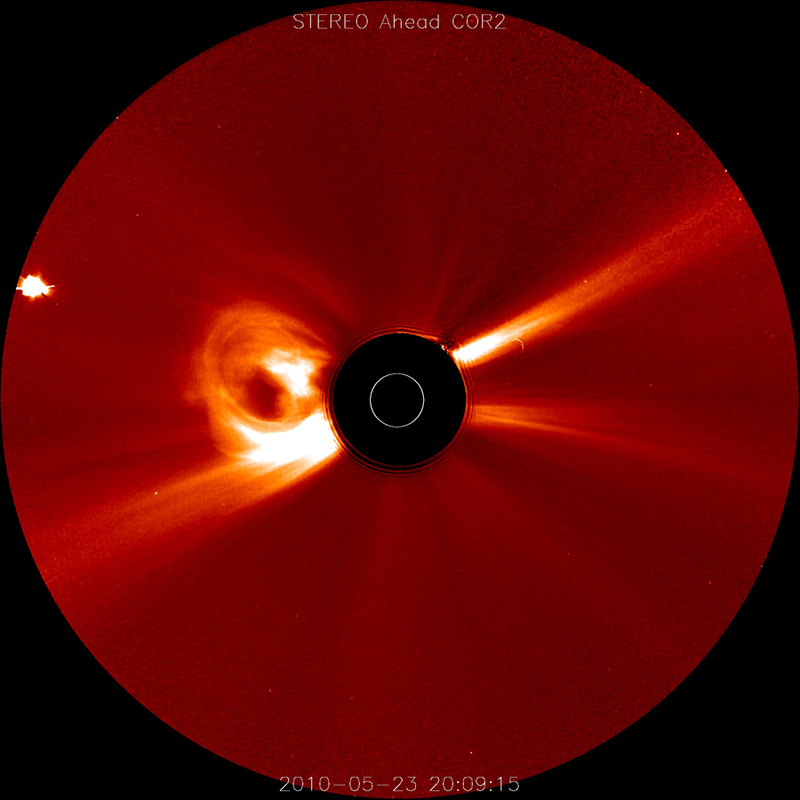 The images show only the Sun’s corona, the outermost layer of the atmosphere. A dark disk covers the rest of the Sun, and a white circle represents the Sun’s surface. Cool huh! Brings new meaning to the phrase “shooting star” doesn’t it? According to the NASA website, a large solar storm, can expel a billion tons of matter at a million miles per hour or more. The strongest solar storms have the potential to interfere with communications, power grids, and satellites. When the charged particles from this solar storm reached Earth, they caused no damage, but there was an amazing “side affect” of these solar flares. In my blog a few months ago I talked about the enormous variety of things on our planet to stimulate our senses (see Scenery to Stimulate the Senses). Another aspect of this variety is how subtle the changes can be. Take a sunrise or a sunset for example. The different layers of colour stretched across the sky changing every second and no two sunsets (or sunrises) are ever the same – truly an amazing thing to see. But sometimes the colours within a captured moment, even though months (in some cases even years) apart can be very similar. To illustrate what I mean, take a look at the two images below. 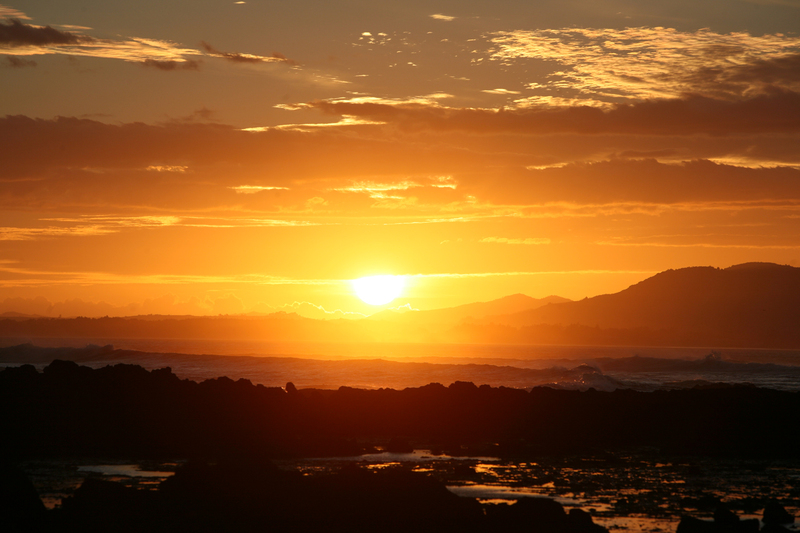 The first image is of a sunrise taken back in April 2009. 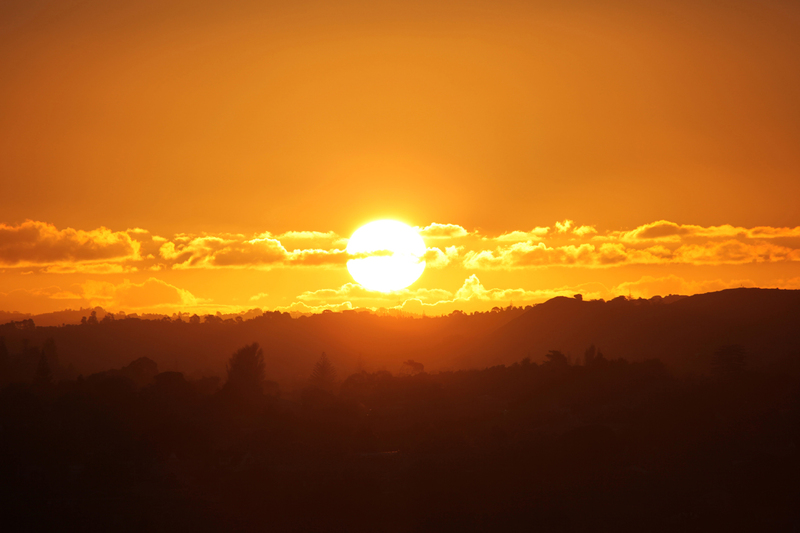 The next image is of a sunset taken just this month. For some more photographs of nature please feel free to visit the Nature & Landscape area of my personal website.